Birds are peachy creatures that entertain us with their acrobatics and add natures touch to many landscapes in the city. But some bird species can also get aggressive, destructive and territorial. Bird droppings are acidic and can harbor spores that can lead to life threatening diseases such as histoplasmosis and leptosporosis, when inhaled by humans. Typically, the birds that can be problematic are the Pigeon, Starling, and the Crow. Bats are more known to cause fear and distress than any other animal to humans. Bat droppings and urine are highly acidic and can damage paint and siding. 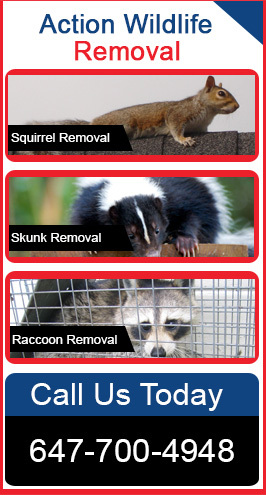 Action Wildlife Removal specializes in humane and safe wildlife removal methods. Like birds, bat droppings can also harbor dangerous spores that when inhaled by humans can cause diseases. The one thing that makes bats even more dangerous than birds however, is that bats can also carry rabies. Action Wildlife Removal, offers exclusion, trapping, and baiting programs for birds and exclusion and removal programs for bats in residential and commercial facilities. Contact our wildlife removal experts to schedule an inspection. We serve Mississauga, Brampton, Orangeville, Caledon, Bolton, Guelph and Georgetown. Are Nuisance Birds and Bats Driving You Crazy? Are bats the latest uninvited guests in your home or office? Are bird and bat droppings causing you to worry about the health of your family? Are these birds and bats causing damage to your property? You’re right to be worried about the problems caused by bird and bat droppings. Apart from the unsightly mess, droppings cause damage to the property and pose health hazards. Pigeon and bat droppings have uric acid. This acid is known to eat into the surface it drops on. Painted surfaces, signs, and other similar materials are very likely to be affected. Dried droppings have various fungal and viral diseases that pose health hazards as well. Histoplasmosis, meningitis, encephalitis and salmonella are some of the most common viral and bacterial diseases that have been associated with bird and bat droppings. Birds are often a welcome sight, but when their populations increase, they can cause some major troubles. Birds cause destruction, build their nests in inconvenient places, leave their mess everywhere and make unwanted noise. If you are someone who likes spending time outdoors but can’t because of birds and bats, it’s time to allow our professionals to move these nuisance animals to another place. At Action Wildlife Removal, we offer safe and effective bird and bat removal services to meet your specific needs. We always practice the latest and most effective humane animal removal methods—methods that work for your residential or commercial property over the long term. Our professionals have the expertise to capture and relocate birds, bats and other wildlife nuisances from homes and office buildings in Mississauga, Brampton, Orangeville, Caledon, Bolton, Guelph and Georgetown. What other animals are troubling you? If birds and bats aren’t the only animals ruining your peace and quiet, contact us for a FREE estimate and consultation. Give us a call for further information about our bird & bat removal services.